"The driving force behind the formation of Boys' Minor Hockey Association in Wetaskiwin and District"
Ralph Pocock was born in Lyn, Ontario in 1909. In 1912 he moved to Wetaskiwin with his parents and lived there until moving to Duhamel in 1918 and later to Fort Saskatchewan. In 1937, Ralph returned to Wetaskiwin to work, however, in 1941 he enlisted in the RCAF and was posted to Prince Rupert. 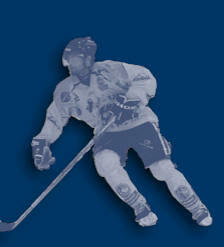 During his years in Fort Saskatchewan and Wetaskiwin he was very active in sports particularly hockey and baseball. Upon his discharge from the armed forces in 1945, Ralph and his family returned to Wetaskiwin. In 1947 the Wetaskiwin Board of Trade established three committees to deal with setting up hockey leagues for older boys in Wetaskiwin. Up until that time, minor hockey in Wetaskiwin consisted of four teams playing house league as well as Midget and Juvenile teams that were organized and coached by teachers and played in school leagues. Ralph Pocock was named chairman of the Junior Sports Committee, which in 1947-48 set out to organize a boys’ minor hockey program in Wetaskiwin. Ralph Pocock became the driving force and local Leagues and All Star teams were organized for Bantam, Midget and Juvenile aged players following the Alberta Hockey Association regulations. That year Ralph managed the school based Juvenile team and also organized a very successful Father-Son year-end banquet where teams were recognized and awards given out. In 1948-49 the leagues developed further, adding Peewee Leagues for boys under 12 with the All Star Bantam Team being coached and managed by Ralph Pocock. In 1949-50, the Wetaskiwin Amateur Athletic Association was formed to free the Board of Trade from sports. Ralph Pocock and Al Arner were the hockey representatives to this Association. That year an intermediate team was organized, adopted the “Colonels” team name and played in the Central Alberta Hockey League. Ralph Pocock was elected their Club President. All-Star teams at all levels that year were also called “Colonels”. From 1947-1950, because of the formation of the different leagues, boy’s hockey participation in Wetaskiwin almost quadrupled. Ralph’s life during those years was consumed with hockey. He and the others involved were engaged in all the details of running the leagues including: registration, schedules, transportation, selecting All-Star Teams, recording the results and statistics, creating the news releases, obtaining sponsors, uniforms, coaches and managers. Ralph’s place of work was the administrative centre of the whole operation. Wetaskiwin’s successful minor hockey organization was studied and copied by those in adjacent towns. The system organized in those three years continues to this day, a credit to the efforts of Ralph Pocock and others. 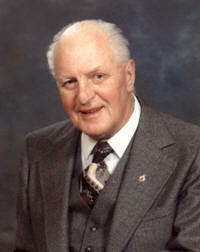 In 1950, Ralph was elected City of Wetaskiwin Alderman and he served on the Recreation Commission. During that time the Tennis Courts and the Curling Rink were built and Ralph physically assisted in these projects working with “hammer and saw”. In 1958 Ralph managed the Wetaskiwin Juveniles however, that year there was a major setback for all ice programs in Wetaskiwin, as the arena was declared structurally unsafe. 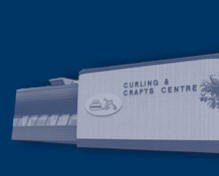 It took until 1962 for a new arena to be approved, constructed and opened. The work done by Ralph and the others involved in the early years became the basis for the Minor Hockey Organization that was revived after the Civic Centre opened. In 1962-63 the Wetaskiwin Colonels re-organized to play in the NCAIHL with Ralph as the manager. The following year he was the Club President and after that, until the demise of the Colonels in 1978, he volunteered as needed. Ralph served as the Coordinator of Peewee Hockey from 1972-1976 and coached one of the teams. Ralph was also involved in Fastball and was manager of the 1975 Tire Town Peewee Provincial Champions. Ralph also worked tirelessly behind the scenes. He made contacts with scouts for the Junior A teams in Western Canada, which resulted in a few Wetaskiwin players being invited to hockey schools and try-out camps. He made sure that no young player was left out due to a lack of finances to purchase skates and equipment. He solicited money from businesses and often contributed financial support himself. As well, he and his wife Jean often drove players to out-of-town games. Many players from Wetaskiwin have played in the NHL, at the Canadian University level, at US schools on scholarships, and in the Western Junior Hockey League. Their successes might not have been possible without the Wetaskiwin Minor Hockey Association, which owes its existence to the efforts of Ralph Pocock.